Scotland’s first “farm to bottle” distillery is to launch a vodka using potatoes grown on the same estate. Arbikie Distillery claims to be the first in Scotland to produce both white and brown spirits that are fermented, distilled, bottled, labelled and matured on-site and made using estate-grown ingredients. The first product from the distillery – Arbikie Vodka – is created using a blend of Maris Piper, King Edward and Cultra potatoes, which are fermented and distilled in copper pot stills. The Stirling family, owners of the Arbikie Highland Estate who have been farming at the site for four generations, claim the use of copper pot stills in the distillation process gives the vodka a “comparable quality and depth to Scotch”. Arbikie Distillery will also produce a whisky and gin from early 2015. Iain Stirling, commercial director of Arbikie Distillery, said: “We saw a real opportunity to utilise Scotland’s acclaimed natural assets from its clear waters, rich crops and temperamental climate, alongside its renowned whisky heritage, to produce a new generation of exceptional quality spirits. “As a family business, it is wonderful to have the freedom to be innovative. We believe that drinking should be no different than the way we eat, goodness from the ground up, from the farm to bottle. We have embraced the French concept of ‘terroir’, which describes how the natural elements of a place determine the characteristics of wine, to create exceptional spirits. 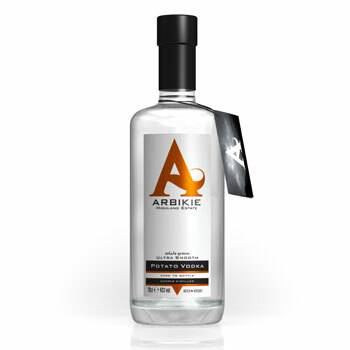 Arbikie Vodka will retail for £42 per bottle in the UK.